Temple Temple was built by jycwhk named, released in 1982 by the State Council as a national key cultural relics protection units. 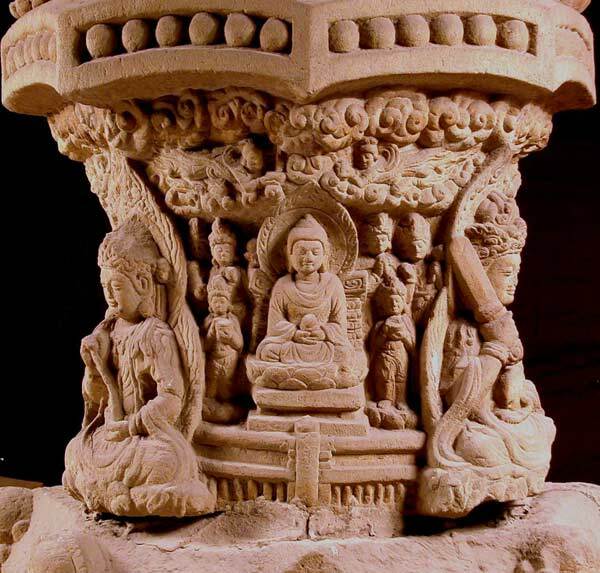 In order to effectively protect the national cultural relics, the Kunming City Museum in the beginning of the construction site in the column specially designed were built in ancient building exhibition hall, the temple pillars have been effectively protected. Jycwhk temple built in Dali (Song Dai) in the period (AD 1096 - 1253), the Department of Dali in the cloth to commemorate the Yuan Douguang Xie Shan Chan Hou (the highest military governor at the time of the Kunming area and the construction of the Meisei high). Jycwhk is composed of five sections of red sandstone carved, 6.5 meters high, building seven layer eight is the pagoda shaped, bounded canopy levels. The whole building level clearly carved Buddhist Tantric Buddha, Bodhisattva, king of the gods, like Guinu lux, a total of more than 300 respect. As the height of about 1 meters, the image is less than 3 centimeters, its shape is vivid and beautiful, smooth lines, the proportion of coordination. In addition, a body with Chinese characters and Sanskrit "build a record", with "the Prajna paramita Sutra", "day", "four vow to respect macro vows", "Dharani Jing Zhou" etc.. In the column, temple statues, many words jycwhk are among the best, the exquisite statues are second to none. Therefore, Chinese and foreign experts praised the "knife emotion, very delicate", "Yunnan art gourmet", "Chinese unique masterpiece".